After you reach a middle age, you begin to like cruises. Why? Because you can visit many countries and interesting places at very affordable prices. I like to get more for my money, who doesn’t? 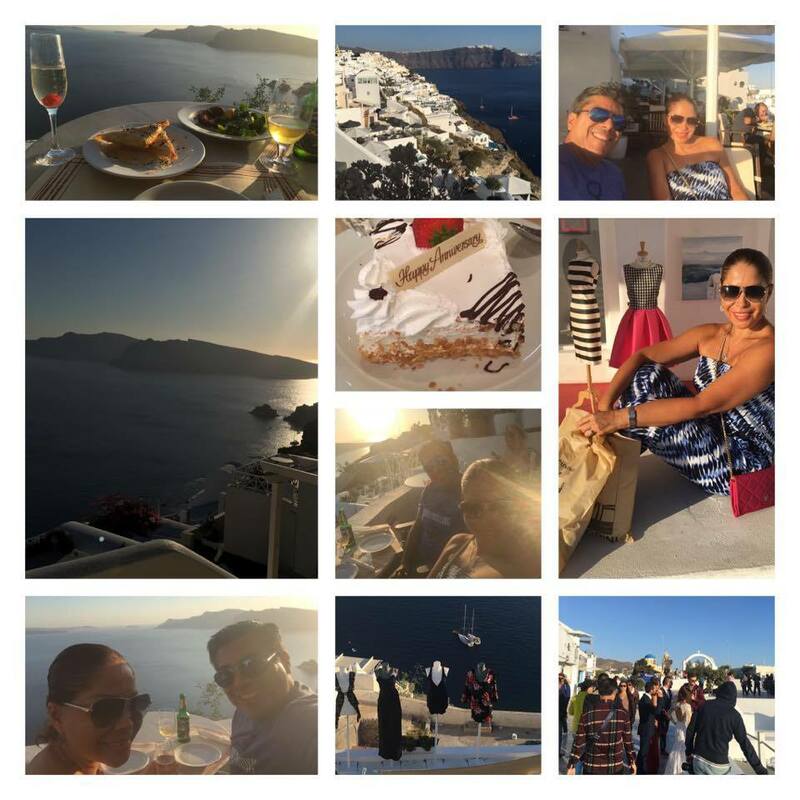 The fact is we always wanted to do a cruise through the Greek Islands, and we took that vacation last year with Norwegian Cruise Line. It was a dream come true. We embarked in Venice, where we stayed for two days at the Hilton Molino Stucky Hotel in Giudecca, a very modern hotel overlooking the canal. 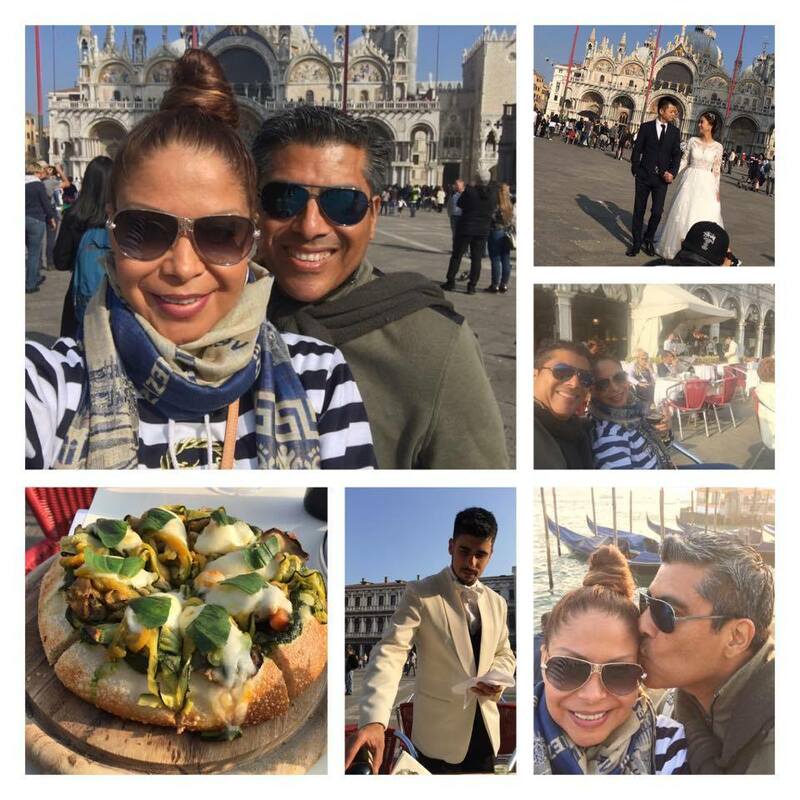 The hotel impressed us greatly, especially the elegant bar on the eighth floor, the “SKYLINE ROOFTOP BAR” with incredible views of the Venice skyline, from the Giudecca Canal to Piazza San Marco–where we started the celebration of our wedding anniversary with good wine and exquisite appetizers. Then the next day, we visited Piazza San Marco, where we bought souvenirs for family and friends and some Venetian murrinas for me (I am a sucker for murrinas). We walked the “Bridge of Sights” and had lunch at the “Gran Caffe Quadri” where we enjoyed live music, the orchestra was excellent! 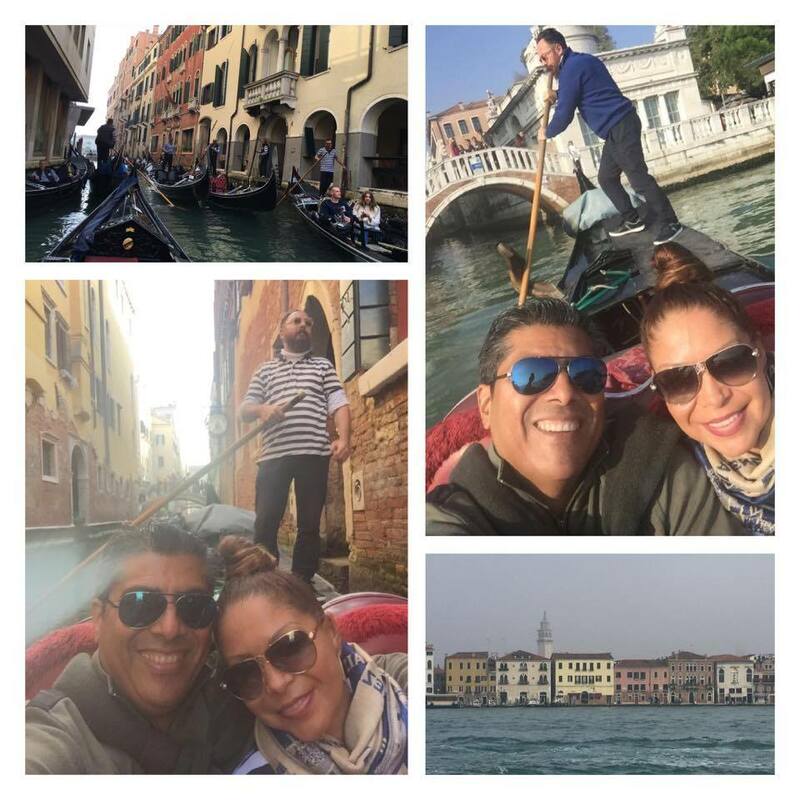 It was all accompanied by good Italian wine; closing with the traditional gondola ride through the canals, which gave us spectacular views of places from different angles—I recommend doing this ride at sunset, and you will see why. Kotor: The next day, we were ready for our cruise! 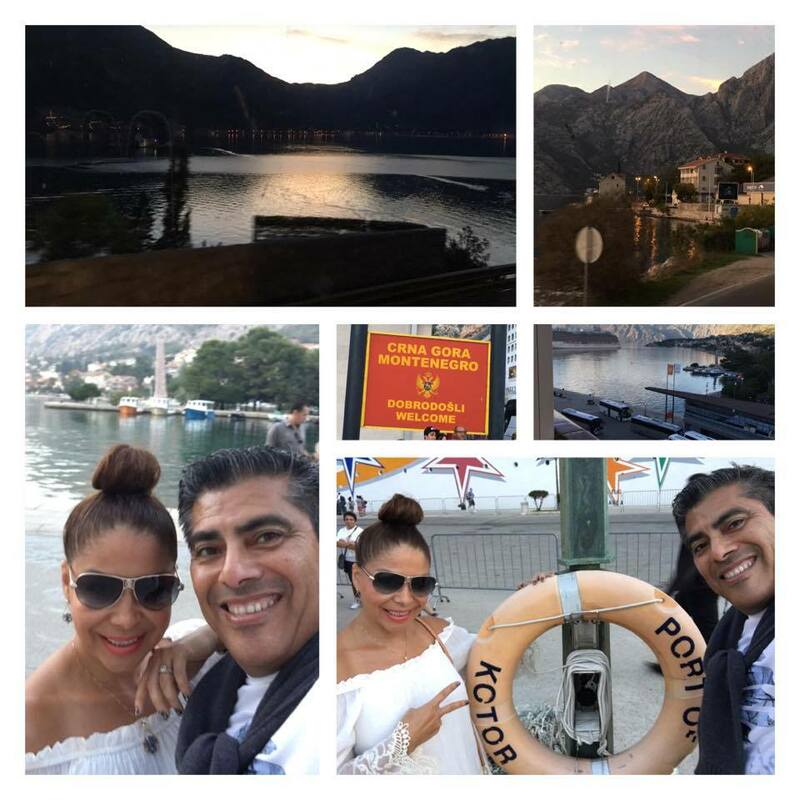 The first stop was in Kotor, a town on the coast of Montenegro. Unfortunately, the boat was delayed, and we had little time there. Even so, we made a short excursion that ended in “Kotor Old Town” — the most popular place there, where we found great souvenirs. Corfu: The next stop was the beautiful island of Corfu. 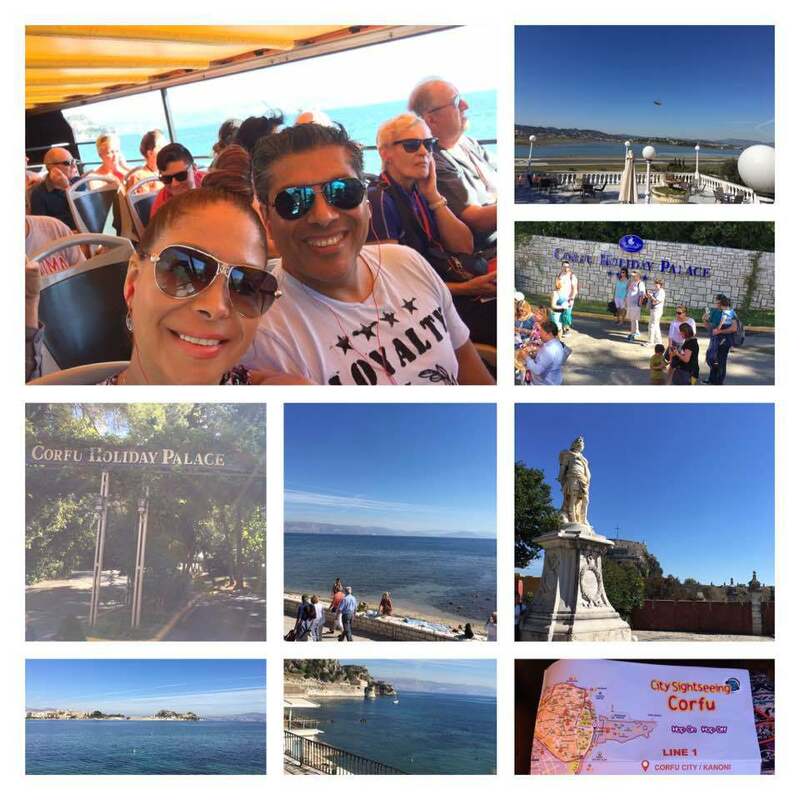 As time flies in these cruises, we decided to take the “City Sightseeing” bus to visit places of interest and then get off at places we liked. Our favorite was: The Newport Mon Repo Palace, The Kanoni and “Spianada SQ Restaurant”…ah don’t worry about the language; the people who work on these excursions speak up to eight languages. Santorini: We wasted no time and went straight to OIA, the fascinating island that lies at the tip of Santorini in Greece. 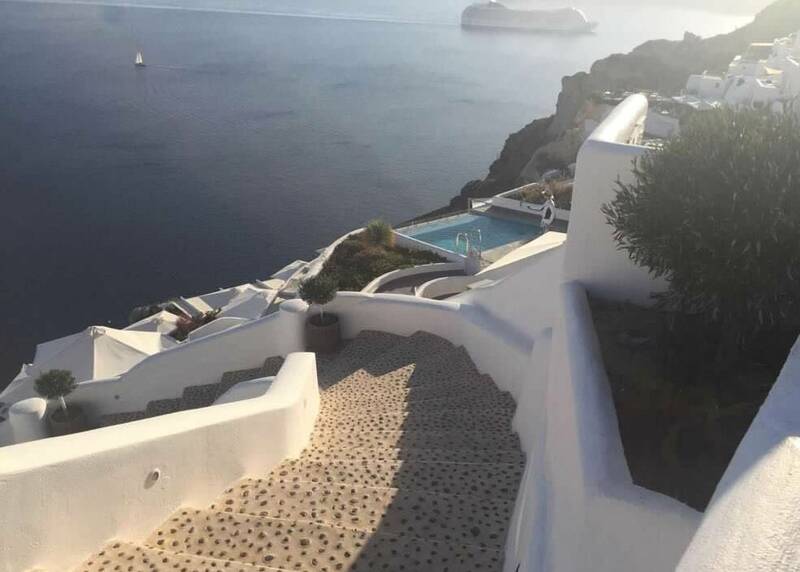 We took a boat directly from the port of FIRA where the cruise left us, and we saved much time (the island is highly visited and one of the most popular in the entire world). 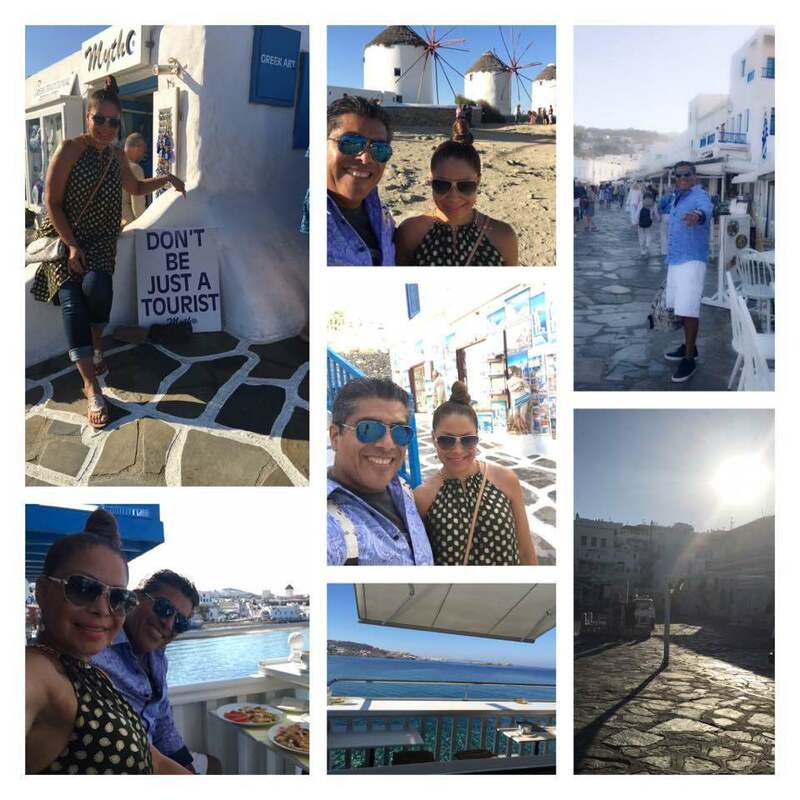 In OIA, we walked as much as we could to know everything, and we were fascinated by the shops, restaurants and the luxurious hotels there. 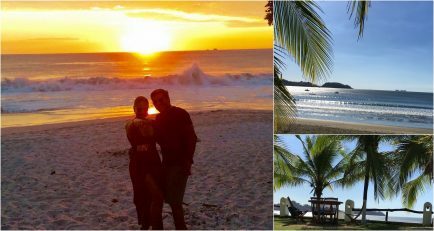 Not in vain is the favorite place for many celebrities to vacation. 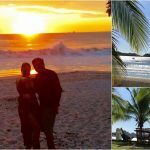 We took the most poetic photos of our lives with impeccable white streets and the views of the ocean with such an amazing sunset –you could see it from any place of your choosing. We chose to have a typical Island lunch at the “218 Degree Restaurant” along with a bottle of champagne. Honestly, we wanted to stay so much longer in OIA; this is an island where we would like to come back to in the future. Mykonos: We arrived in Mykonos early in the morning, which was magical. We walked to “Little Venice” where we had breakfast in the “Katerina’s Restaurant and Cocktail Bar” that is located almost over the water; we were able to appreciate numerous fishes from our seat; until Los Molinos (another tourist attraction) could be seen from there. We closed with a splash in the beach, which left us relaxed and ready for the “White party” that was at night on the boat. Dubrovnik: Who isn’t a fan of “The Game of Thrones”? In this port, we had the opportunity to visit the infamous “King’s Landing” and tour the castle where we had lunch at the top. The view was apotheosis; it made you remember the whole series! Even the church made you feel inspired! 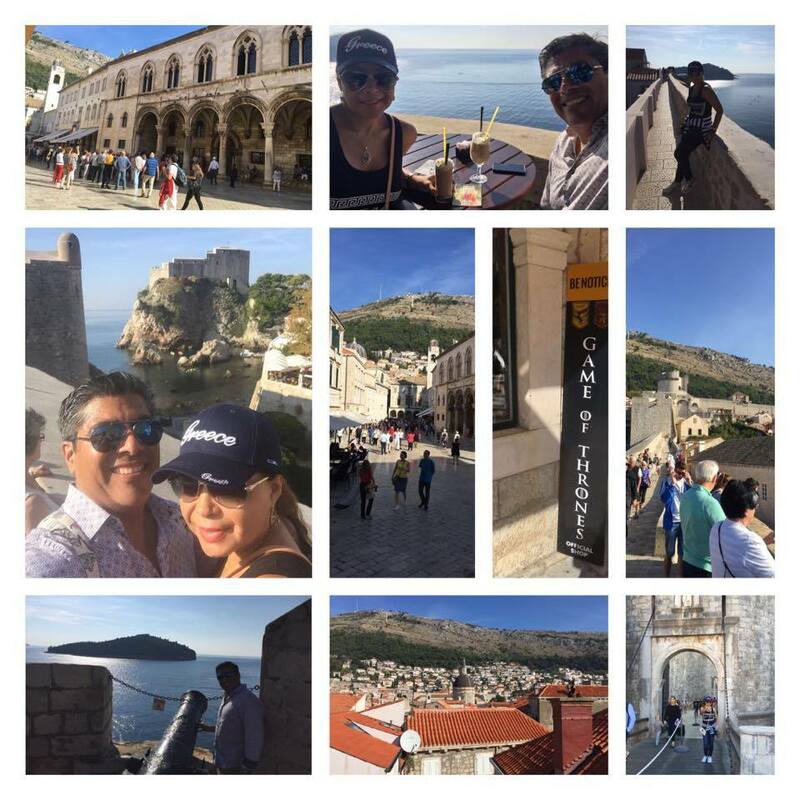 On the way back to the cruise, we walked the whole area to the port, and we discovered how beautiful Dubrovnik is, with gorgeous beaches and fascinating hotels on every corner, resulting in a city we want to come back to on another vacation. Verona: As the cruise left us in Venice, we gave ourselves a fabulous gift to close our wedding anniversary and rent a car. We drove to meet Verona, because yes, we wanted to see the place that inspired Shakespeare to write his masterpiece Romeo and Juliet. We visited the “Casa di Giulietta” and did the ritual of padlocks there with other couples, and we took a walk to the “Piazza delle Erbe” and the “Torre dei Lamberti”. Then, we stopped for lunch at “Caffe Anselmi”—locals recommended this place as having the best lasagna and spaghetti pesto in town. I loved that it rained, and people continued enjoying their moment … it was truly a “Dolce Far niente” for us! 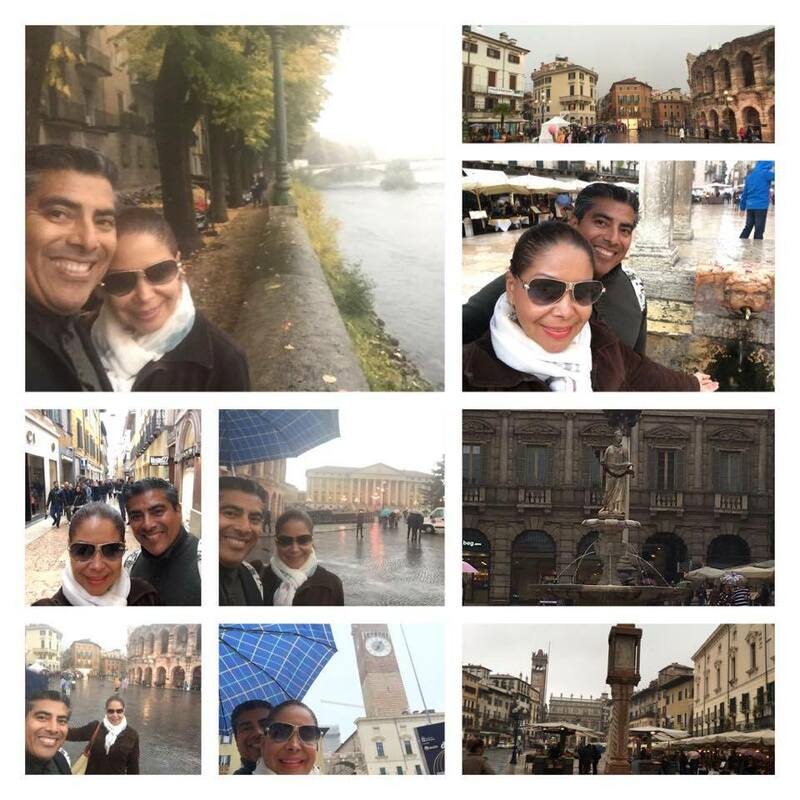 Well, we did the same and walked with our umbrellas (under the rain) to the “Arena Di Verona” which looks a lot like the Roman Colosseum (they make the operas of the city there) and the imposing “Castelvecchio” bridge – to drive back to our hotel and come back the next day, early, to our beloved Miami! Viajes en pareja: crucero por las islas griegas. Una vez que alcanzas la mediana edad, te empiezan a gustar mucho los cruceros. ¿ Saben por qué? Porque se puede visitar muchos países y conocer espectaculares sitios de interés en menos tiempo y ahorrando mucho. La cosas es que me gusta obtener más por mi dinero, ¿ y a quién no? Mi esposo y yo, siempre quisimos hacer un crucero por las islas griegas, y finalmente pudimos tomamos esas vacaciones el año pasado con la línea de cruceros Norwegian– y fue un sueño hecho realidad. Les cuento que nos embarcamos en Venecia, donde pasamos dos días en el Hotel Hilton Molino Stucky en Giudecca, un hotel muy moderno que nos impresionó enormemente, especialmente el elegante bar en el octavo piso, el “SKYLINE ROOFTOP BAR”, con increíbles vistas del horizonte de Venecia, desde el Canal Giudecca hasta la Piazza San Marco. Allí comenzamos la celebración de nuestro aniversario de bodas con buen vino y exquisitos aperitivos de la región. Al día siguiente, visitamos la “Piazza San Marco”, donde compramos souvenirs para familiares y amigos y murrinas venecianas para mí (soy fanática de las murrinas). Caminamos por el “Puente de los Deseos” y almorzamos en el “Gran Caffé Quadri” donde disfrutamos de música en vivo, ¡la orquesta fue excelente! Todo acompañado de un vinito italiano; cerrando con el tradicional paseo en góndola por los canales, que nos brindó vistas espectaculares de Venecia desde diferentes ángulos–recomiendo hacer este paseo al atardecer ya verán por qué. Kotor: ¡Al día siguiente, estábamos listos para nuestro crucero! La primera parada fue en Kotor, una ciudad en la costa de Montenegro. Desafortunadamente, el barco se retrasó, y tuvimos poco tiempo allí. Aun así, hicimos una breve excursión que terminó en “Kotor Old Town”, el lugar más popular allí. Corfú: la siguiente parada fue la hermosa isla de Corfú. Como el tiempo vuela en estos cruceros, decidimos tomar el autobús “City Sightseeing” para visitar lugares de interés y luego bajar en los lugares que nos gustaban. Nuestro favorito fue: el nuevo “Port Mon Repo Palace”, el “Kanoni” y el “Spianada SQ Restaurante”…ah y no te preocupen por el idioma; Las personas que trabajan en estas excursiones hablan hasta ocho idiomas. 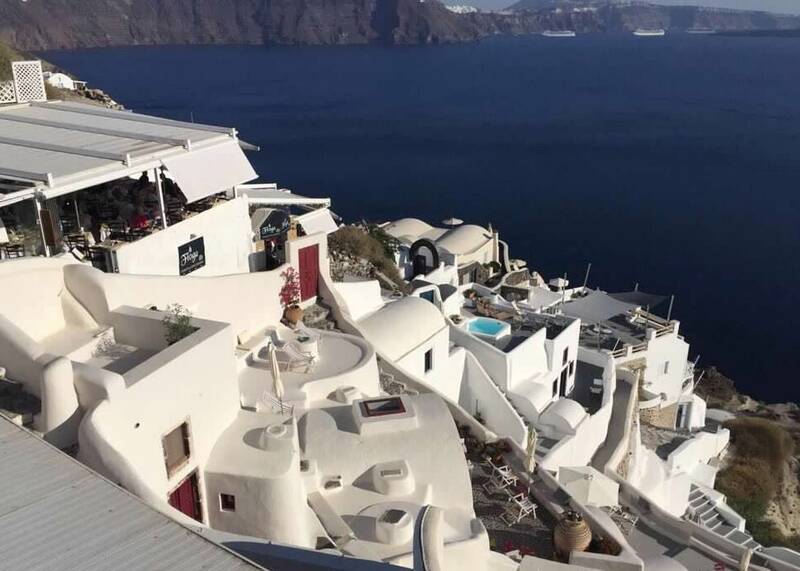 Santorini: Les cuento que aquí, no perdimos tiempo y fuimos directamente a OIA, la fascinante isla que se encuentra en la punta de Santorini. Tomamos un barco directamente desde el puerto de FIRA, donde nos dejó el crucero, y ahorramos mucho tiempo (la isla es muy visitada y una de las más populares de todo el mundo). En OIA, caminamos todo lo que pudimos para conocerlo todo, quedamos encantados con las tiendas, los restaurantes y los lujosos hoteles allí. 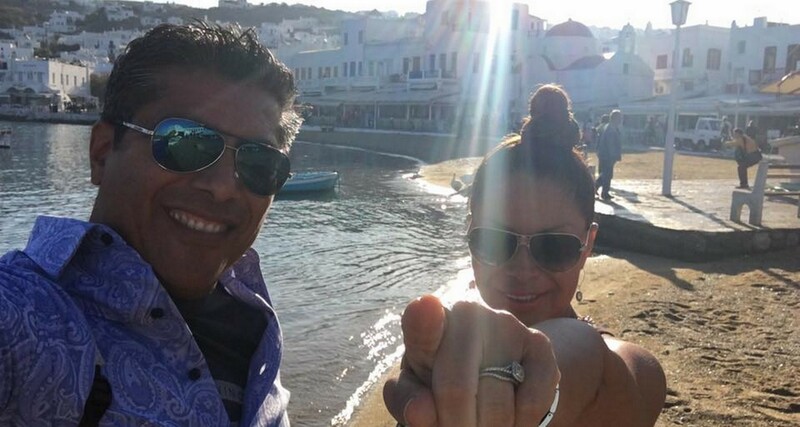 No en vano, OIA es el lugar favorito de muchas celebridades para vacacionar. Tomamos las fotos más poéticas de nuestras vidas con impecables calles blancas y las vistas del océano con una puesta de sol tan asombrosa, que se podía visualizar desde cualquier lugar que uno eligiera… Elegimos un almuerzo típico de la isla en el “Restaurante 218 Grados” junto con una botella de champán en nuestra parada a descansar… donde honestamente, no queríamos irnos; esta es una isla a la que nos gustaría volver en el futuro. Mykonos: Llegamos a Mykonos temprano en la mañana, lo cual fue muy mágico. Caminamos hasta “Little Venice” (Pequeña Venecia) donde desayunamos en el “Katerina’s Bar” que se encuentra casi sobre el agua; Pudimos apreciar numerosos peces desde nuestro asiento; hasta Los Molinos (otra atracción turística) se podía ver desde allí. 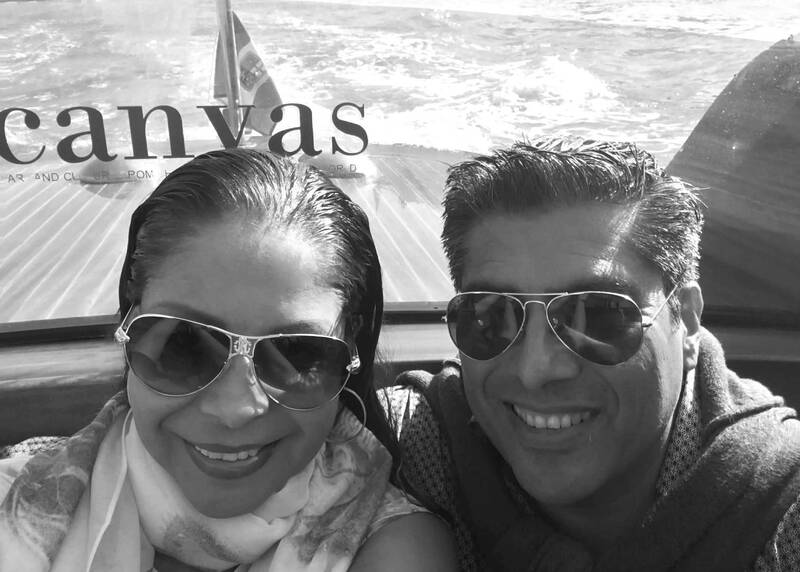 Luego, fuimos de compras y caminamos por el hermoso y pequeño pueblo, y nos reunimos con el “Padrino de bodas” (Jonathan) quien estaba de vacaciones en Europa y voló hasta Mykonos para almorzar con nosotros en el popular restaurante de mariscos “SALPAROS”. La comida fue muy exquisita y hermosa la celebración que tuvimos allí con nuestro querido amigo, mejor imposible … Cerramos con un chapuzón en la playa, lo que nos dejó relajados y listos para el “White Party” que había en la noche en el barco. Dubrovnik: ¿Quién no es fanático de la serie “El Juego de los Tronos” (“The Game of Thrones”)? En este puerto, tuvimos la oportunidad de visitar el super famoso “King’s Landing” y recorrer todo castillo, donde terminamos almorzando en la parte superior, donde la vista es apoteósica—te hace recordar toda la serie ¡Incluso hasta la iglesia te hace sentir inspirado! En el camino de regreso al crucero, caminamos por toda el área hasta el puerto, y descubrimos lo hermosa que es Dubrovnik, con playas espectaculares y fascinantes hoteles en cada esquina, lo que resultó en otra ciudad que agregamos a nuestro “bucket list” a la que queremos regresar en otras vacaciones. 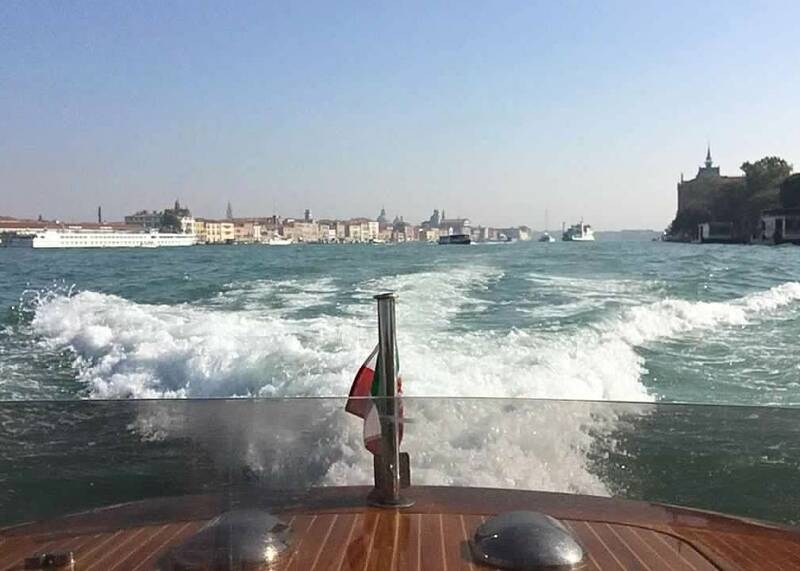 Verona: Cuando el crucero nos dejó en Venecia, nos dimos un regalo fabuloso para cerrar nuestro aniversario de bodas, por lo que alquilamos un carro. Manejamos hasta Verona; queríamos conocer el lugar que inspiró a Shakespeare para escribir su obra maestra “Romeo y Julieta”. Visitamos la “Casa di Giulietta” e hicimos el ritual de los candados allí con otras parejas, y dimos un paseo hasta la “Piazza delle Erbe” y la “Torre dei Lamberti”. Luego, nos detuvimos a almorzar en “Caffe Anselmi”: los locales nos habían recomendado este lugar por tener la mejor lasaña y espaguetis al pesto de la ciudad. Me encantó que lloviera porque la gente continuó disfrutando su dia como si nada … ¡pues, les cuento que hicimos lo mismo! Caminamos con nuestros paraguas bajo la lluvia hasta la “Arena di Verona”; que se parece mucho al Coliseo Romano (hacen las óperas de la ciudad allí) y fuimos luego bajo la lluvia aun hasta el imponente puente “Castelvecchio”, desde donde manejamos hasta nuestro hotel, para volar bien temprano a nuestro querida Miami!